Having cat allergy is one major headache for animal lovers, because despite how much you love kittens, you can't be around them. If you could just snap your fingers and make your allergies vanish forever, you'd probably do it without thinking twice. But, what would you do it if the cause of your sneezing, watery eyes, and runny nose is your favorite kitty? It's the moment when that 'oh-so-simple' decision becomes an extremely tough call. Unfortunately, more than 90 million Americans have to make this tough decision because their doctor confirms they are allergic to their pets. When it comes to pet allergies, cat allergies are more common. Therefore, it really makes sense to explore your options and see if finding your kitten a new home is the only choice. How Do I Know If I'm Allergic to Cats? It all starts with a telltale sniffle, watery eyes, and an occasional cough. You think you're getting a cold, but the cold never comes and the runny nose never dries up. It may well be a sign of a pet allergy. The interesting thing is that reactions to cats can sometimes be immediate, happening in minutes, or may take hours or even days to affect a person. A stuffy nose and eye inflammation are the two most common signs that you have an allergy. It usually happens when you breathe in pet dander, which leads to itching and swelling of the membranes around your nose and eyes. 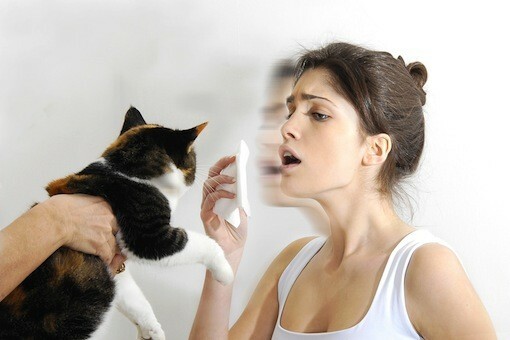 If the cat dander is small enough, it may enter your lungs and cause symptoms such as coughing, difficulty breathing, and wheezing. A rash that appears on your neck, face, or upper chest after you come in contact with a cat is another sign of pet allergies. Are Infants More Prone to Cat Allergies? There was a time when scientists were of the view that infants who are exposed to pet are more likely to develop allergies in the later stages of their lives. The recent studies have actually debunked the myth stating that babies who live with cats during the first year of their lives are more likely to have a stronger immune system due to the development of certain antibodies. However, if your child has already developed cat allergy, you may have no other choice but to find that sweet little kitten a new home. The symptoms will tell the story, but sometimes, your cat itself is not to blame. It is therefore a good idea to consult with your doctor who may conduct a series of skin tests, in which they expose your skin to small allergens or samples of the proteins dropped by dog, cat, and other allergy-triggering substances, such as dust or pollen. This is the easiest way to decide if you should really be blaming Mr. Whiskers or something else is creating problems. About 10% of Americans has pet allergies, with cat allergy twice as common as dog allergy are. Cats produce different types of allergens or proteins that cause allergy. These allergens are usually on the skin/fur of your cat or in its saliva. Dander is one of the most stubborn allergens, and many furry or feathered pets, including dogs and cats, produce dander. It is made up of tiny, dandruff-like flakes of dead skin. Besides, proteins from urine and saliva can also cause allergies and aggravate asthma. These allergens only affect people with oversensitive immune systems. In this case, the body takes a harmless thing like cat dander as a dangerous invader. The reaction of the body to these allergens causes certain allergy symptoms. It means that if you're someone with oversensitive immune system, it is important to find what causes your immune system to go berserk and leave you with itchy, watery eyes and a runny nose. Sometimes, it's not the cat itself, but pollen and dust in a cat's coat that is the root cause of your allergy symptoms. A family doctor or a pediatrician can help you identify and treat your allergy symptoms. Specific allergy drugs will be your first line of defense. Your allergist may ask you to start with intranasal steroids or oral antihistamines, such as Allegra, Claritin, etc. Allegra-D and other decongestant may also help relieve allergy symptoms. In some cases, you may have to get allergy shots, which is a way to boost immunity to the allergen. Unfortunately, it's not always effective and isn't safe for kids under age 5. Therefore, taking your medications and reducing exposure to cats can only alleviate the severity of symptoms. The bottom line is that exposure to cats can lead to serious allergies and aggravate your asthma. Unfortunately, you cannot find a cat that you can call 'hypoallergenic'. Even worse is the fact that cat allergen can stay in your house for 20 weeks or more after you've removed the pet. You have to take medications, limit your exposure to cats, and maintain a proactive approach rather than waiting for allergies to get better overtime. Out-of-control allergies can make living difficult, so talk to your doctor today to know your options. Avoid hugging, kissing, or even touching a cat. Even a little contact is enough to land you in trouble. Beware of people who own cats because even if they don't bring their cat with them, they still carry the dander with them on their clothing. Even this indirect exposure can cause allergy symptoms. Keep the cat out of your bedroom and be sure to maintain your distance. It is important to ensure that your cat is not allowed to roam free. Someone else from your family should come forward and take full responsibility for the cat's care. Ask a family member to give your cat a bath on a regular basis. Although experts are not sure if this is really going to help, it's definitely worth trying, especially if it doesn't leave your cat traumatized. Pay special attention to cleaning your rooms. It is important to sweep and mop the floors, clean furniture properly, and vacuum the rugs on a regular basis. A vacuum with a HEPA filter may also help a bit. Try anti-allergen sprays to deactivate allergens, and if you're not allergic to dust mites and pollen, you may consider leaving your windows open during the day to increase the ventilation in your home.